Combining a love of horses with an expertise in textiles, entrepreneurs Hans and Bo founded Hansbo Sport in 1977 to create a new kind of rug – one that would keep horses dry and also breathe. Their multi-purpose rug, made from a special fabric woven and stitched in Sweden, was a huge success. In the 1980s and 1990s, Hansbo rugs were used by the equestrian Olympic teams of Sweden, Finland and England. We also became purveyors to HM The Queen of England when Hansbo multi-purpose rugs were ordered for the horses at the Buckingham Palace stables. It was important to us from the start that our products meet the needs of professional riders. During our 40 years in business, we have worked to continually enhance our products and expand our range. Keeping pace with the new requirements that different disciplines create for both riders and horses has been an exciting challenge. All our products are evaluated thoroughly before we begin production, with sponsor riders at various levels putting our innovations to the test. Among them are the Rio 2016 silver medalist, as well as riders competing in international and national levels in dressage, jumping, eventing, western and trotting. Product development and design at Hansbo are still centred in Sweden, while production is carried out in different parts of the world. We demand high standards from the factories that produce our products, and all meet REACH’s and Childhood’s more specific requirements. We have worked with many of these factories for over 25 years, and continue to ensure that they comply with and evolve with requirements all over the world. Now we’re taking another exciting step in our product development with a specially designed series that features rugs, saddle pads and halters containing both ceramic and magnetic materials – with properties that can enhance the wellbeing of your horse and have a nurturing effect. WHAT IS HANSBO SPORT ICM? The Hansbo Sport ICM series combines two revolutionary therapies, Ceramic and Magnetic – which are typically found separately – into one dynamic product. This innovative, dual action healing technology targets vulnerable areas of the horse – before, during and after hard work. With a focus on prevention and rehabilitation, our latest product line is also designed for optimal fit, function and style. 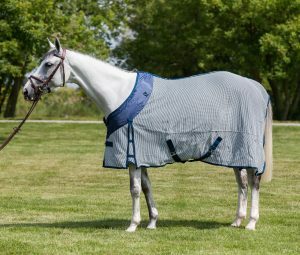 Hansbo Sport ICM wraps, rugs, boots, saddle pads and harnesses work by generating their own FIR radiation, giving the horse a greater feeling of wellbeing, helping to prevent injuries, and increase the speed of healing. Far Infrared Rays (FIR) are invisible waves of energy that have the ability to penetrate many layers of the horse’s body, and Far Infrared therapy is used to gently heal, soothe, stimulate and detox the physical body, and as well can have a soothing effect on the mind. FIR very gently accelerates blood circulation in the body by expanding the capillaries that carry blood. When worn – Hansbo ICM Products increases oxygenation and regeneration of the blood, which activates infrared waves from body heat in specific areas of need to aid in healing. This technology further activates sensitive nerves, which reduces muscle tension and stimulates the body to emit endorphins, creating a sense of wellbeing. As the processes interact, the effect of the infrared waves reaches deeper into the body and can also have a positive effect on inflammation. Use of ceramic fabrics can increase blood flow by up to 80% and reduce muscle spasms. Increased blood circulation speeds up healing in skin and muscle, tendons and ligaments, as well as bones. Supporting your horse’s wellbeing helps it to perform at its peak. Regular use of HANSBO SPORT ICM enables a faster recovery period after exercise. RECOMMENDED BY VETERINARIANS, PROFESSIONALS AND EVERYDAY USERS.